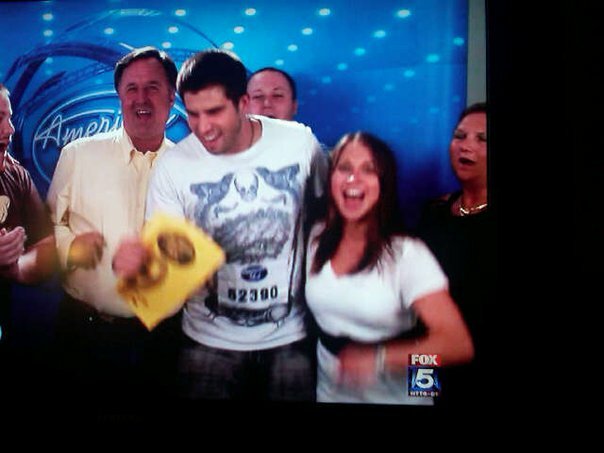 In 2009, I was a contestant on the Fox TV show “American Idol”, and it was a life changing experience for me. Each step along the road to Hollywood was a new challenge for me as a musician and as a person, and when it was all over, I was a much more confident performer than I had been before. I made it to the top 90 on season 9, which was the last season with Simon Cowell. The other judges were Kara DiGuardi, Randy Jackson, and in Boston, Posh Spice (Victoria Beckham) and in Hollywood, Ellen DeGeneres. In the years since, it’s been a really fun story to tell and a source of questions for lots of people. In the first part of this blog I’ll talk about the experience up to getting the Golden Ticket, then in a future blog I’ll tell you all about how I prepared and what Hollywood was like. For the first audition, I happened to be playing shows in Boston and New Hampshire with Stealing Jane surrounding the audition dates at Gillette Stadium. I drove separately, and waited overnight for early tickets, then I didn’t worry about being first into the stadium a few days later, thanks to some fantastic advice from some friends I made on the overnight line, Bobby and Katie. Once I got the ticket, I headed to Boston to play with Stealing Jane, then up to New Hampshire. The morning after the second show, I headed back down to Gillette Stadium and found my seat. I arrived after most of the line interviews and crowd shots, and just found my seat in the stadium and waited for my section to be called to the field. I had a few songs planned, in case they asked for more. I started off with I’ll Be by Edwin McCain, two lines of the first verse, then right to the chorus. I honestly can’t remember what the other songs I had planned were now. I’d been practicing them for days, to make them short and sweet clips to show off my voice. After a line of the chorus of I’ll Be, the judge, or intern, or whatever stopped me and asked for something else. I got nervous because I’d already seen them deny people, and choose people based on one song, so this felt like a death round. For some reason, without thinking, I started singing Hey Jude. It was just the first song that came into my head. I let myself think “wait, why am I singing this” one time, then just committed, and looked for some long notes I could fit in there. I skipped around in the song, and the stopped me after about 20 seconds, thought, and sent me through. I didn’t even fully process what had happened, I had to wave goodbye to Bobby and Katie and follow a path into the locker room area of the stadium. I didn’t know what to expect, would I turn a corner and see the judges and lights and suddenly be on TV? Would they just take my name and tell me to come back that afternoon? Nope. I was there for hours filling out psychological evaluations and nondisclosure agreements, getting information on the next steps, and waiting for processing. When I finally got out it was mid afternoon and they were still working through the stadium of people. It was a beautiful summer day in June and I met up with Bobby and Katie and had 5 Guys burgers for the first time. Then we said our goodbyes and I went back to long island to wait a week or so for the next round of auditions. I didn’t get any details about how many rounds there would be, so each time I entered a judging room, I thought “maybe this is it!”. For the entire week running up to the audition, I was going over I’ll Be and a new song for me that I was super connected to, “Dig” by Incubus. The second round would be in a Hotel in Boston. I recruited my girlfriend at the time, now wife, Melissa and #mybestfriendBunce to come along, in case this was it and I needed a crowd to share the news with, or in case I totally bombed and needed drinking buddies. We got a room in the hotel, got up early and headed down to the audition in the morning. Even though I thought we were early, we totally missed the early lineups and crowd shots and screaming and yelling, but I was fine with that, I had a number and so there wasn’t really any reason to get there at the crack of dawn. The first song I sang was “Dig” by Incubus for a table full of producers I didn’t recognize. They seemed impressed with my singing but they were not into the song choice. Their thought was that Incubus songs usually need the instrumentation for the melody to sound right, even when you nail it acapella, it can be hard for a listener to follow without hearing the band. I took that advice to heart, and they decided to move me on to another round that was apparently later that day. Now I sang for a camera crew and some higher up looking producers, and I decided to go with a song Id been singing in solo gigs for a while, “Kiss From A Rose” by Seal. I didn’t get to many comments from this group of bigwigs, but they did decide to move me on, and told me that the next round would be with the TV judges, in a few days. When I got out of that audition, the anxiety that had been with me all day hit like a ton of bricks and I took a stress nap in the hotel room, it was about 2pm. Bunce decided to sleep too so we could recharge and go out that night. Unbeknownst to us, Melissa left the room, found a laminated sign board and but my chest number in it, went out and bought some beers and a bottle of wine and set up this beautiful display in the hotel room for me to see when I woke up. THAT was when the validation of making it this far, the pride, the strength of the support I had around me really hit home. On our way home from Boston Round 2, we got a call that Melissa’s Dad had gone into the hospital with chest pain. We rushed home and straight to the hospital to find out that he would be undergoing bypass surgery in a few days. I remember going to the diner with the family and discussing the rollercoaster of the day, the positive and negative uncertainty in our future. In the next few days, we put together a caravan (they never said how many family members to bring, so I sort of made an open invite). We filled the band’s van and my parents car and all headed up to Boston for the first TV round in which I’d have the chance to get a Golden Ticket to Hollywood. I invited Bobby and Katie, my new friends from the line and the first auditions. They had been such a huge support and we’d spent more than 24 hours together. I wanted to have them there at the end, or the beginning of the next chapter. 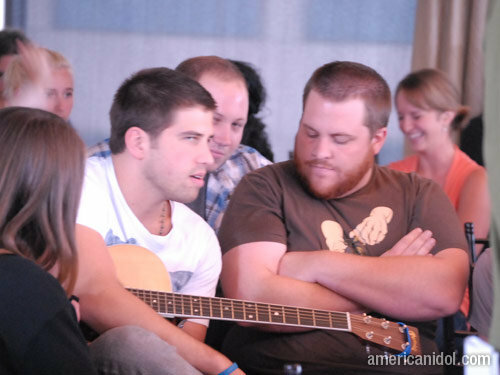 I remember warming up with Bunce in the waiting room, singing some of our band’s songs and cover songs together. Singing together really helped to release the tension and get my mind off of the audition coming up. Side note: One thing that did make me a little uncomfortable all along was watching the producers encourage and build up people who were clearly a little bit mentally unstable, or delusional, just so that the judges could deny them and chop them down. It felt really wrong to see them coming out of the early interviews with big smiles when you know they were there to be laughed at. I’m glad that they seem to have changed that approach in the AI reboot. 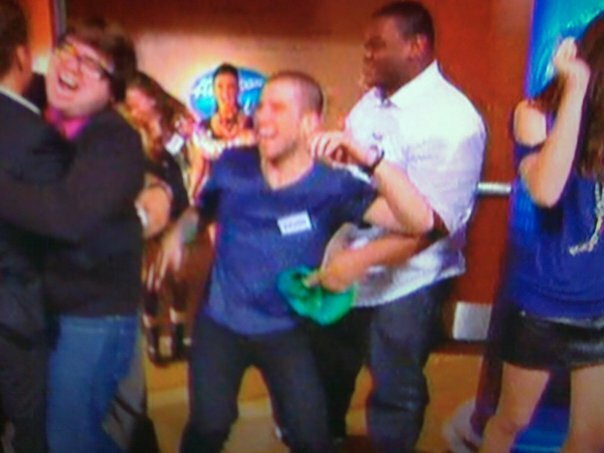 Anyway, one moment that I will never forget, was the first time Ryan Seacrest entered the room. This guy, couldn’t have been taller than 5’8, and in a heartbeat he had the entire room in the palm of his hand. He spoke so clearly, so intimately, and so rapidly, a few things became instantly clear to me. 1. Being a host is a bigger job than it seems. And 2. Seacrest was born for it. I remember him giving me a little pep talk before going in, (“it’s just like the last few, you got this” I’m paraphrasing because it’s all a little fuzzy.) I walked into the sound stage on the top floor of the hotel in Boston turned a corner and saw the judges there. It kind of felt like I was watching them on TV, they were so recognizable and almost unreal, thanks to the lighting and the makeup and all of the glamour. I started by closing my eyes, and sang “Kiss From a Rose” until they stopped me. Victoria Beckham really seemed to like my outfit (which may have been because Melissa had pretty much styled me after her husband). I recieved the coveted “Yo Dawg that was pretty good!” and they discussed the performance a bit. I really can’t remember what they said about me, but I do remember it not feeling set in stone when Simon called to vote. I remember feeling like someone was going to say no, based on what they had been saying. It was strange because I had felt so sure it would happen, I went in with confidence, but then that confidence wavered as they were talking. It was a surprise, a confirmation, and an affirmation that all of the work I’d been putting in these years was recognized. I remember collecting my golden ticket form the judges, and shaking their hands, and that was when they became real people to me. I had the realization that these judges are just human, fallible people who have been tasked with deciding the future of other people. They’re actors playing huge versions of themselves for the show, and their decisions mattered for the direction of the show. As I continued in Hollywood, this impression would solidify as I watched the camera people frantically try to capture footage to be ready for any decision that the judges hand down. I slowly cracked open the door and peeked out. They were waiting anxiously. When I pulled the ticket out from behind my back, Everyone jumped on top of me except my mom, who launched herself on top of Ryan Seacrest. Looking back at those pictures and that video, especially now that I have kids, seeing the smile on my Dad’s face, pure joy, gives me so much pride. I remember how excited Melissa’s sister Juliana was, she was the first one to hug me when I brought out the ticket, she was ten years old at the time. My sister, Jenny, was jumping up and down barely touching the ground. Carlos had a boot on from an injury with the NY Redbulls, (which was actually why he was able to come), he had his crutches in the air and was jumping on one leg. My friend Sean had a smile from ear to hear and was jumping and hugging everyone, Bunce and Bobby and Katie were on top of the pile. I think back to that moment and the genuine joy and excitement that everyone was feeling, and I am so proud that I was able to give them that experience, proud that my work had been validated, and so grateful to them all for traveling for me, showing me that selfless love and support that made it all possible. After I got the golden ticket, there were hours and hours of interviews in booths, photos, psychological exams and forms to fill out once again. A whole new round of non-disclosure forms, and a new schedule to prepare for. It was after 10pm when I finally got out, and most of my family and friends had started the ride home to get to work the next day. I did go to the bar with my parents and those who were left for a drink, but the day had been exhausting and my mind was already on the next steps. In my next blog I’ll talk about what I did to prepare, my time in Hollywood, and what it was like to come home with some success but without what I thought was the prize.